Put down your plastic flower tumbler and drink like a Viking. When you are seeking the most authentic, Norse drinking vessel this side of Valhalla, there is no substitute. 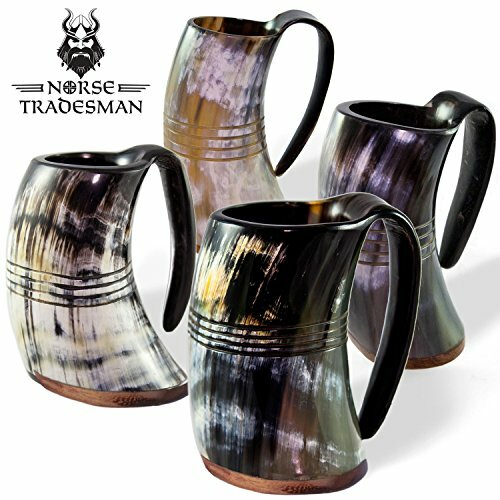 Norse TradesmanÂ®, the leader in authentic Viking crafts, brings you the highest quality drinking horn set available to mere mortals. Each Norse Tradesman drinking horn is, of course, fashioned from real ox and cow horn, ethically sourced from slaughterhouses in which the animals are harvested for their meat. Hand cut, hand carved and hand polished, each mug is truly a unique piece of Viking lore. The horn is super-heated in order to create the seamless curved handle, which is simply an extention of the horn itself, carefully bent back after heating. The Norse Tradesmanâ"¢ drinking horn is 100% food safe, as its interior is coated with all-natural beeswax. Drink beer, mead, ale, liquor or any other cold beverage with confidence. However, do not drink hot beverages out of your tankard, as this WILL damage the beeswax seal. This also means you should NOT place the horn in your dishwasher. Besides, the Norsemen didn't have fancy dishwashing machines! Care for your horn like the Norse treasure that it is. Now raise your horns in honor of the old Norsemen! Raise your horns in remembrance of a time when life was simple and victory was sealed in blood! SkÃ¥l! DRINK FROM GENUINE OX HORN - Made of authentic, ethically sourced ox horn (Veterinary Health Sanitary Certificate - Livestock) and a premium wooden base (no plastic). SHOW OFF YOUR UNIQUE SET - Traditionally crafted & hand-engraved. Every tankard is unique in shape & color & the lot comes packaged in a medieval burlap sack. Each horn is completely unique in color, volume and shape. PREMIUM WOODEN BASE - These sturdy tankards are fitted with pure rosewood bottoms, one of the most durable and rich timbers available. TOUT SIZEABLE TANKARDS - Each tankard holds around 750 mls or 24 ounces of your favorite cold beverage (we try our best to standardize the volume of each tankard, but as these are authentic ox-horns, SIZES DO VARY slightly). If you have any questions about this product by Norse Tradesman, contact us by completing and submitting the form below. If you are looking for a specif part number, please include it with your message.